Because of limited ductility and brittle failure modes observed in testing of rigid adhesive shear wall systems, such systems are limited in SDPWS to seismic design categories A, B, and C and the values of R and Ω0 are limited to R=1.5 and Ω0=2.5 unless other values are approved. The use of adhesives in combination with nailing for mitigating floor vibration, increasing floor stiffness for gravity loading, and reducing the potential for squeaking in horizontal wood floor diaphragms is associated with beneficial contribution to diaphragm strength over that provided by nailing alone and is not subject to limitations on use for seismic. 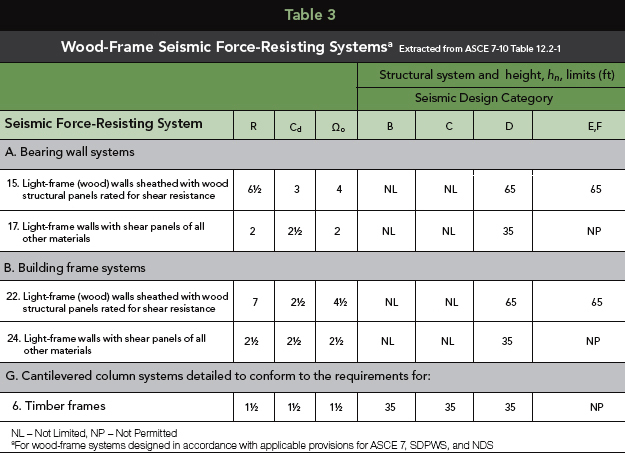 Specific wood-frame seismic force-resisting systems recognized in ASCE 7 are listed in Table 3. In accordance with ASCE 7, each seismic force-resisting system is associated with seismic design coefficients (R, Cd and Ωo) and height limitations based on seismic design category (SDC). For wood-frame seismic force-resisting systems, listed seismic design coefficients are applicable for systems designed in accordance with the SDPWS for wood-frame shear walls and diaphragms and with the NDS for wood member and connection design. In typical wood-frame platform construction, the bearing wall system category is generally applicable because shear walls used for seismic force resistance also function to support gravity loads of the building. While slightly larger R-factors are associated with shear walls in building frame systems in which gravity loads are carried by a separate structural system (such as a structural frame of beams and columns) and the shear walls resist seismic shear loading only, this type of structural system is less prevalent than standard platform construction. The slight increase in R-factor recognized for building frame systems is based largely on the judgment that the shear walls providing shear resistance in such systems are less susceptible to strength and stiffness degradation from combined gravity and seismic shear loading than shear walls in bearing wall systems.